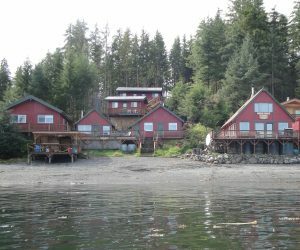 Green Rocks Wilderness Lodge is located in southeast Alaska, on the east end of Kupreanof Island. About midway between Juneau and Ketchikan. Although we are in a remote area, you can get here very easily. Alaska Airlines provides twice daily jet service to Petersburg. 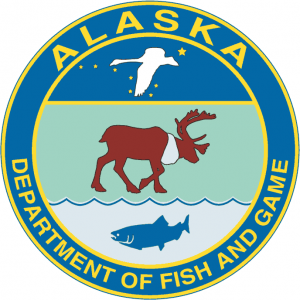 Salmon fishing and halibut fishing are unguided and done in protected waters. We will provide you with maps and information to the fishing grounds. You’ll be fishing within two minutes to 30 minutes from the lodge. 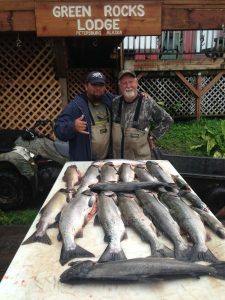 We fish for: King Salmon (20-40 lbs), Sockeye Salmon (4-10 lbs), Pink Salmon (2-5 lbs), Silver Salmon (8-15 lbs) and of course Halibut (15-90 lbs) are common. However, much larger Halibut are caught (110-300 lbs). In addition to our fantastic Halibut and Salmon fishing we also have available: Rockfish, Shrimp, Cutthroat Trout and Dolly Varden with 5 rivers within 30 minutes for river and Fly Fishing. We also supply you with a crab pot for catching Dungeness Crab which are very plentiful. The main lodge is where meals are served and where many years of experience is shared. There are 7 private cabins that sleep 2-7 guests comfortably. The beds have comfortable mattresses and we supply all the bedding. The cabins have full modern bathrooms, tables, chairs and heat. Our boats are 18 ft Lunds. Side console steering with 50 horse motors and a 6 horse tiller drive trolling motor. Guests have unlimited use of their assigned boat. Fish whenever you like. The boats have all Coast Guard safety equipment. 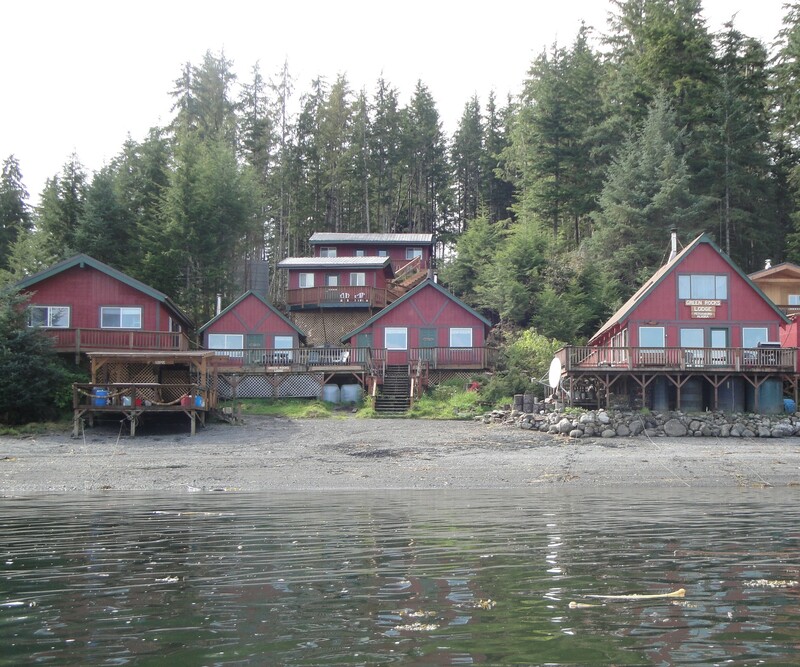 We supply our guests with both Salmon and Halibut poles, reels, terminal gear and bait for the duration of your stay. We filet, vacuum seal, and freeze your catch for you. Each day we serve a full course breakfast and dinner menu. Hearty breakfasts include: eggs, bacon, sausage, or ham, fresh fruit, pancakes, french toast, biscuits and gravy. Bountiful dinners include: Honey ginger salmon, steak, Mango Glazed Pork Loin and Prime Rib and includes homemade dessert. Lunches are soup and sandwiches if you are at the lodge at lunchtime, or a bagged lunch to take on your boat with you.